This past week we got out first glimpses of the look of F1 in 2018 as both Haas and Williams released the first images of their 2018 contenders. Both events were fairly low key, Haas just sent out a press release with their images, while Williams held a press conference. We'll chat about the cars on this week's show, but here's a look at what was shown off. Haas was the first one out of the gate, and our first look at the finalized version of the halo. 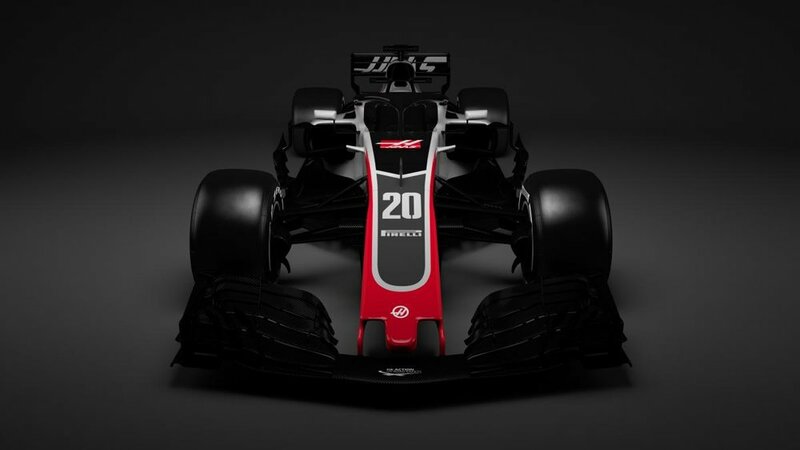 The initial commentary was that Haas had done a good job to blend in the halo and make it less noticeable, but we're not sure we agree that showing pictures of the black halo and overall dark colored car against a dark background was an indication that they had done anything to make the halo blend in. The halo is more visible in the side shot. On the Williams the halo clearly stands out, and overall it appears to make the cockpit look taller than it really is. Posted on February 17, 2018 by Michael.